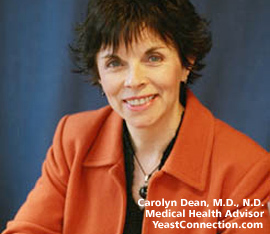 Dr. Carolyn Dean is both a medical doctor and a naturopathic doctor. Dr. Dean offers private fee-for-service telephone consultations. In these sessions, she can provide more in-depth attention to your health and wellness issues, and give you advice from her 30 years of experience in the successful treatment of yeast overgrowth and many other conditions. Visit www.carolyndean.com. How to deal with mold continues to be a frequent problem for clients that consult me. The power of bright sunlight would be enough to repel mold from your dark and dank basement, but since that's not possible there are some recommendations I would make. You can hire an environmental clean up crew that specializes in mold removal. Safe mold removal uses mold enzymes and ozone. Some companies use strong chemicals that bring their own dangers. If you want to tackle the clean-up job yourself with mold enzymes and ozone you should only use HEPA air filtration masks and rubber gloves. Mold spores, once disrupted will invisibly fly into your nose and mouth and can cause many health problems. There are two mold banishing enzymes that you can research. One is called Moldzyme at www.moldzyme.com; another is Sporicidin at www.americanairandwater.com. Next, look for an ozone machine that can give a moldy room an intense shock treatment. The amount of ozone needed to treat mold is dangerous to your lungs. You cannot be in the same room with this machine. Research ozone shock treatment for mold at www.air-zone.com or www.mold-kill.com. If your problem is mold spots in your bathroom, shower, or sink, use Moldzyme or Sporicidin, but make sure you use gloves. You can also use these types of products to wash down your bathroom tiles to prevent mold build up. On a final note, the air cleaners that claim to trap mold spores may do that but they probably can't kill the mold itself growing on damp walls, sinks, or the grout between tiles. © Woman's Health Connection. A Division of Professional Books. All Rights Reserved.